If you’ve lost a tooth, need to have a tooth removed, or are having difficulty keeping bridges or dentures in place, dental implants can help you achieve a beautiful, confident smile. Alexander Visot, DDS performs dental implant procedures right in his office in Woodland Hills, California, and in some cases, he can do the implant in one day. To schedule a consultation, call the office or use the online booking tool. Dental implants are used to replace natural teeth and are surgically placed right into your jawbone. This is done by inserting a metal screw-like anchor into the jawbone, and then the surrounding gum and bone tissue around the implant are given time to heal. Nearly all patients can return to work the day following the implant procedure, as there’s generally little-to-no pain or swelling. 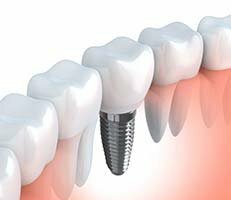 After the area heals and bone grows around the anchor, Dr. Visot connects a metal post to the implant to hold your replacement tooth -- a crown -- in place. The crown is color-matched to surrounding teeth for a natural look. Dental implants provide excellent support for artificial teeth and keep them from slipping and sliding inside your mouth. Implants can also be used to secure dentures or bridges. Dental implants become fused with your jawbone tissue in a process called osseointegration, so they’re stable and can fully support your replacement teeth. With implants, your replacement teeth are held firmly in place, which is essential for eating and speaking. This stability makes crowns, fitted dentures, and bridges placed over the implants feel incredibly natural. To be a candidate for dental implants, you must have healthy gums and enough strong bone to support the implants. For the right candidate, Dr. Visot offers convenient same-day extraction and dental implant placement at his office. Some patients may need a bone graft before an implant can be placed. If there isn’t enough bone in your jaw for the implant to be anchored securely, a bone graft may be necessary. If more bone is needed at the implant location, bone grafting adds volume and strength to the implant site. Dr. Visot reviews the grafting options with you, including whether it will be made of your bone or other materials. The bone graft is placed deeper in the socket where the implant will go, and over time it becomes fused to your existing bone, helping to strengthen it. It also helps you generate new bone at the site. The thicker width and volume of jawbone provides a more solid anchor for your implant. How long will bone grafting take? It can take up to six months for the new bone to heal and become strong enough to support the implanted tooth. 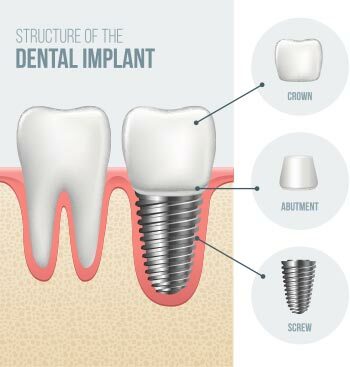 After the bone has healed, Dr. Visot can place the metal anchor for your dental implant. Follow-up visits and good oral hygiene are critical to maintaining success after getting dental implants. Call the office or use the online scheduling tool to set up an appointment with Dr. Visot to find out if dental implants are the solution for you.